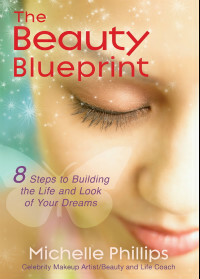 I am proud to award The Beauty Blueprint - 8 Steps to Building the Life and Look of Your Dreams, our Best Ever You Blue Ribbon Award. Here at The Best Ever You Network, we believe that looking and feeling great both start within, and so it is with great pleasure that we introduce you to author Michelle Phillps, who shares that same philosophy.. Phillips, a celebrity make-up artist, life coach and motivational speaker has changed the lives of countless women through her approach to beauty. 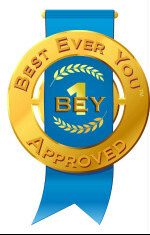 Michelle recently appeared on Best Ever You Radio. From live TV to live events Michelle has inspired and entertained millions. By combining her knowledge as a Life Coach with her years of working as a celebrity makeup artist, Michelle has created formulas for authentic beauty and success. From appearance, attitude, personal goals, performance and relationships, Michelle provides a “blueprint” that empowers people and positively impacts them far beyond simple makeovers. Michelle knows firsthand what it takes to succeed against the odds. Although she is from the Phillips family of music and TV, her entry into the entertainment industry was a humble one. She dreamed of working as a celebrity makeup artist at a time when it wasn’t a viable career choice. Through hard work and determination she eventually went on to work with major networks and stars of film, TV, and music such as: NBC, CBS, ABC, CNN, Katie Couric, Deborah Norville, Colbie Caillat, Jeff Foxworthy, Doris Roberts, and more. Along the way Michelle was asked to move in front of the camera as the beauty and style correspondent on Tampa Bay’s 10, eventually being cast as the host of the station’s morning talk show, Studio 10. Since then she has made appearances on; The Daily Buzz, Gal Time, Head Drama, BetterTV, SheKnowsTV, HSN, TLC, HGTV, Best Ever You Radio and shows across the country. While working behind the scenes, and eventually in front of the camera, Michelle made some very important discoveries, the biggest being the connection between inner strength and outer beauty. Making this connection led her to create a process to help others achieve and live their true beauty. Michelle can now show you the right foundation for your skin tone and provide the right foundation for your personal success, providing a strategy for ‘beautiful’ living inside and out. The process Michelle created provides a strategy for living a ‘beautiful’ life by covering areas such as; enhancing self-image, overcoming obstacles, health and fitness, style and beauty, goal setting and empowerment, life balance and more. While women across the world spend millions every month searching for tips and inspiration to make their lives better, Michelle provides help that will take them beyond what they’ve been told is the meaning of success. 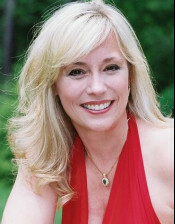 She has made it her mission to help others live their beauty by sharing her message in her speaking programs, TV appearances, weekly radio show on Hay House Radio, and in her best-selling beauty and self-esteem book, “The Beauty Blueprint- 8 Steps to Building the Life and Look of Your Dreams” (Hay House, 2011). ps- Elizabeth is the typo queen. If you see one, just let her know. Liz, our editor, has just discovered her love of trust, sincerity and vintage clothes all in one day.